LED Light Bulbs have been gaining a LOT of attention recently. Super low voltage LED lighting uses one twentieth the energy of incandescent bulbs and lasts more than 10 times longer. The coolest development in lighting is LED Light Bulbs. Energy efficient LED (light emitting diode) technology produces pure light without generating heat and so requires very low voltage to run. That translates into significantly lower operating costs for you, and a noticeable reduction in your energy bill. And who doesn't want a reduction in energy costs? The initial cost of a bulb is higher than other types but it'll more than make up for it in the number bulbs you'll need in a 10 year span and energy savings over its lifetime. Making the switch to LED can be done one bulb at a time, just start with the most used bulb in the house. The next time you change an awkward bulb make it the last time by replacing it with a long lived LED light. No matter what your strategy is, there's never been a better time to look at LED as an alternative. Prices have dropped to a more manageable cost and the energy savings start as soon as you flip the switch. Additionally, recent tweaking has brought these bulbs up to the lighting standards we've come to expect from traditional bulbs. By clustering the intense lights into various sizes and configurations LED's can address any lighting demand you can throw at it. Now you can have it all; low energy draw, bright natural light at an affordable price. LED's are durable, contain NO hazardous materials and are unaffected by temperature and humidity. No more trade-offs. There's even a dimmable option and lights that emit a warm yellowish glow (like incandescent bulbs). There's an LED bulb type for every application including overhead lights, spotlights, security lights, 12 Volt lights, even indoor and outdoor Christmas displays. LED Household Light Bulbs Bulbs for every household application are available right now; from overheads to chandeliers to cozy lamplight to LED bulb lights. LED Security Lights Make your passage around your property at night safe and at the same time deter intruders with clusters of tiny led bulbs. LED Flood Lights Newer technology has produced bulbs intense enough for flood lights. 12V LED Lights On-the-go lighting that makes the most of the juice in your batteries. 12v led's use so little energy that once we switched on the boat we no longer needed to buy another solar panel to meet our energy needs. LED Fairy Lights We like to keep the fairy lights up year round. They make a perfect night light entwined through the ficus plant. LED Garden Lights Solar garden lights are now outfitted with led bulbs which prolongs the life of the battery and the length of time the light stays on. LED Outdoor Christmas Lights No need to shave the Christmas display in these tight economic times. Switching to LED Christmas lighting will claim a barely noticeable amount of energy. Durable - LED's are much tougher than their cousins. They'll stand up to being dropped and some you could even drive over without rendering them useless. Bright light - There lights are intensely bright when you want them to be but many can be dimmed and others are covered with a softening lens to achieve any light quality desired. Low energy cost - This is where you'll realize the savings. LED light bulbs require between one tenth and one twentieth the energy to operate as an incandescent. Runs cool - Light emitting diodes emit light, not heat. Incandescent and halogen lights run hot and you pay for that unwanted heat. Additionally, the low operating tenperature helps to keep summer indoor temperatures from soaring thus taming the need for AC. Long Life - Current lifetime estimates range from 5 to 25 years depending on the way it's used bulb type and manufacturer. Most household bulbs are expected to last for 25,000 to 50,000 hours. Perfect for that entryway light you need a scaffold and a contortionist to change. The actual lifetime of a bulb is still to be determined, since the calculations exceed the age of the technology we don't yet really know how long they will last but we do know how long they have lasted and projections are based on the information currently available. The downsides of LED lighting technology are rapidly being resolved. Cost - Although cost has been cited as a major downside with some bulbs costing $50.00 and better, the good news is that the prices are falling rapidly and the decline will continue as popularity increases. We've scoured the internet to offer bulbs at the best prices available. Light Quality - Light emitting diodes cast a pure bluish white light. In some cases the color works very well for the purpose but for some applications a warmer white is desired. Many companies have designed warm white LED's and filters. Light intensity - Tiny diodes emit a beam of intense light not bright enough on its own to be very impressive. By clustering the tiny intense lights together the LED's are able to achieve flood light intensity in a single housing. Lumens are a measurement of light that is used to describe the intensity of a light source. Every LED bulb will be assigned a number that coresponds to the number of lumens it can emit. 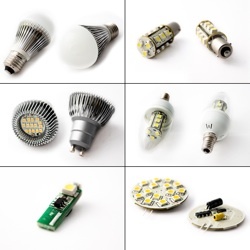 As a general rule every 100 to 150 lumens is equivalent to approximately to 10 watts incandescent -- 400 - 600 lumens equals about 40 - 50 watts incandescent, it'll take 800 - 1000 lumens to produce the amount of light a 60 watt incandescent bulb emits and in order to achieve the equivalent of a 100 watt incandescent bulb an LED bulb will need to cast at least 1000 lumens and 1500 would be better. If you want more control over the brightness of your lights, dimmable LED's have recently made their debut. Dimmable bulbs are more expensive to purchase and there are some early reports that hint that they don't last as long as non-dimmables but they still last much longer than incandescents. In order to accurately calculate the cost of any bulb, the cost to run the bulb must be considered, when compared to the one being replaced. A 100 watt incandescent bulb consumes 100 watts of energy per 1 hour of continuous use... an LED bulb that emits an equivalent amount of light will consume 18 to 20 watts per hour. One fifth the energy for the same result. The initial cost of an LED bulb will depend upon the type and voltage of the light, many are now selling for less than $20 USD. In the long run, however, LED's are the economical choice, and not just by a little bit. When the cost of the bulbs and the energy to operate them (at today's prices) are factored over 50,000 hours (the estimated life of an LED bulb), the savings amount to about $550 USD per bulb. Multiply that by 10 bulbs and you'll save $5,500 over the life of the LED bulb - at 20 bulbs the savings are a very significant $11,000. There's no arguing that the long term savings of LED Light bulbs far outweigh the initial cost... and the really good news is that the cost is dropping fast. Select your bulb for the specific location you'll use it in. Not just lumens and watts but ensure that the light glows in the direction you need it to. The bases of many LED light bulbs are solid and the light only shines away from them. Chandeliers and some upright fixtures (lamps) need a bulb that has a wide spectrum that allows the light to shine downward from the base as well as the top. LED Light Bulbs make a fantastic housewarming gift that lasts for years for environmentally conscious friends and family members. Visitors to our LED Light Bulbs page may also be interested in the following pages.